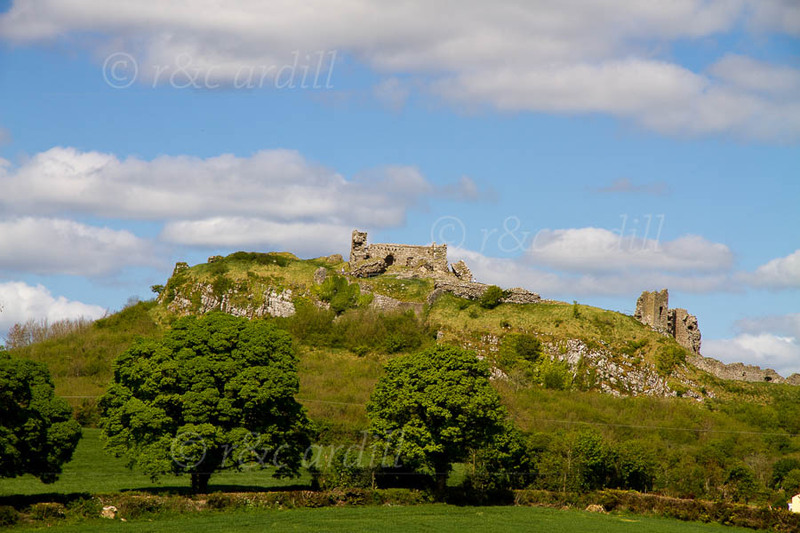 Photo of: Midlands of Ireland: Laois: Rock of Dunamase. The Rock of Dunamase is a Celtic stronghold built on one of the lovely hills that dominate the countryside east of Portloaise. Through the centuries, warriors have fought to control this limestone outcrop. The first known settlement on the rock was Dun Masc (or the Fort of Masc), an early Christian settlement that was pillaged in 842 by the Vikings. When the Normans arrived in Ireland in the late 1100s, Dunamaise became the most important Anglo-Norman fortification in Laois: it was part of the dowry of Aoife, the daughter of Diarmuid Mac Murrough, King of Leinster, when she was given in marriage to the Norman conqueror Strongbow in 1170. When Isabel, the daughter of Strongbow and Aoife, wed William Marshal, Earl of Pembroke, Dunamase was part of her marriage portion.